!A Su Salud! 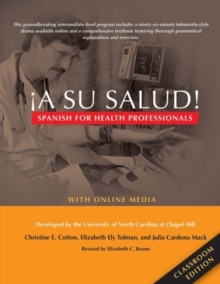 : Spanish for Health Professionals, Classroom Edition is an intermediate-level Spanish language program designed for students and practicing healthcare professionals. Learners work with vocabulary and grammar within the context of a telenovela called La comunidad, which features authentic Spanish spoken by native speakers in a variety of accents. This revised edition is ideal for classroom use and includes online access to the media program. Major features of the revised program include:Online media which includes the 96-minute telenovela drama La comunidad, as well as dozens of additional clips that help students practice their language skills and learn more about the culture of their Hispanic patientsNew readings from external sources on medical topics that spark student discussionDozens of exercises from the original interactive DVD-ROM program have been incorporated into the textbookA Recursos website with links to important language, culture, and health-related sites.